The Shar-Pei’s many wrinkles were cultivated by breeders in China to give the dog an advantage in dogfights. It was hard to be pinned down with all the excess skin. Bred in the southern provinces of China, the Chinese Shar-Pei is an ancient dog and traces its ancestry back to the Han Dynasty (220 BC – 202 BC). He was developed in the village of Dah-Let near the South China Sea as working dogs who guarded the family, farms and temples. 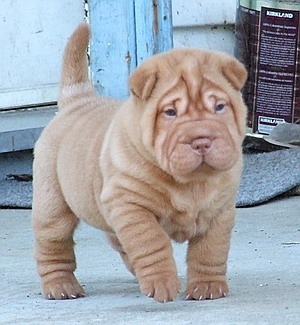 The Shar-pei is immediately recognizable because of his most distinguishing feature: his wrinkles! In Chinese his name translates to “draping sandpaper like skin”, a reference to his bristly skin folded into many wrinkles. Puppies tend to ‘grow into’ their wrinkles as they mature. Too much bathing and an improper diet may lead to skin problems. This dog must receive regular grooming with special attention paid to his ears and toe nails. Once considered the rarest breed in the world, the Shar-Pei made a comeback from virtual extinction in the 1970s. Although he has been used as a fighting dog, he has also been bred for hunting, protection, and herding. 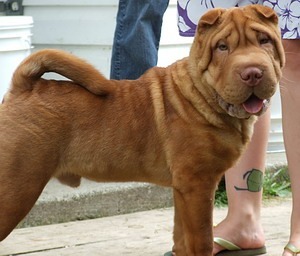 The Shar-Pei stands about 20 inches (50 cm) tall at the shoulder and weighs in at 40 to 60 pounds (18-27 kg). He has a short, extremely harsh coat that may be any solid colour or sable. One unusual characteristic of this breed is his blue-black tongue. This feature is shared by only two other dogs, the Chow Chow and the Thai Ridgeback. Although he was once known as the Chinese Fighting Dog, his temperament made him unsuited for fighting as he is generally good-natured and friendly. The Shar-Pei is intensely loyal to his family. His attitude with strangers is independent, aloof, and watchful. As such he makes a natural guard dog. As devoted as he is to his family, this is not the dog to be left in the kennel. As with any breed, training should be started early to develop good manners. The Shar-Pei is clever and intuitive, and learns quickly. He should be socialized from an early age to children, strangers, and other animals. He requires regular exercise.